The first question we should ask is what do we think fashion is? For me it's quite a simple answer, fashion helps us to show who we are, our personality, our conformity and our social placement and attitudes visually; it's a form of communication. So that leads to the question what is fashion photography and to me the answer, again very simply is, it depends! 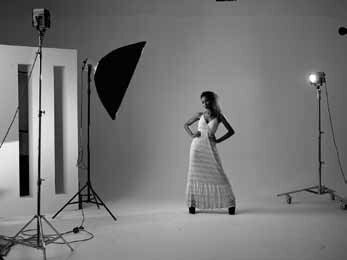 In my simple world there are two types of fashion photography the commercial and the inspirational. To me, commercial photography sells a product, inspirational photography sells a mood, a feeling, an emotion, a lifestyle ... a dream! I thought I'd shoot for this month's magazine and demonstrate creating two distinct and separate moods with two models and two outfits. Two distinct looks needing two distinctly different moods. All I have to create the diversity in the images is in the posing, lighting and composition of the images ... exactly the same ingredients, so to speak, it's up to me to add them and 'mix' them to get the desired end result. Image one is a full length study of Kimberly from Cliche Models, Manchester in a full length D&G gown - I wanted elegance and sophistication whilst bringing out the texture of the gown and the beautiful sheen to her skin. We must remember that we are aiming to tell a three-dimensional lie in a two-dimensional medium and with black skin we can't really do that by adding shadow ... so it's the specular highlight we have to place. 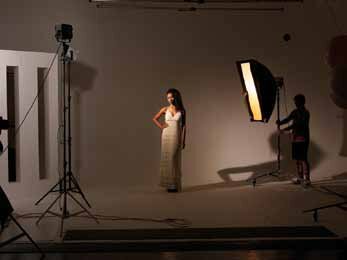 This image is a simple three-light set-up. I decided to kill two birds with one stone, I've been asked to give the Hedler continuous HMI lights a good test so that that this would be a fab opportunity. The 'Key' light is a Hedler DF15 fresnel ... a focusable light, capable of going from flood to spot, with the twist of a dial.